Are you in search of a living lesson on Hinduism? If so, your search undoubtedly ends as soon as you reach Varanasi in the state of Uttar Pradesh. Once struck by this beautiful dale, can't escape the magnetic charm of the Ghats of Varanasi. Ganga Ghats at Varanasi are holding a reputed holy status to the Hindus. Some of the ghats of this 3000 years old living city dates back to pre-historic times. From birth to death, these ghats have seen all the related ceremonies. You will find specialized 'Pandits' to perform all the rituals here. Seeing all the traditional rituals, which are performing here, are a lifetime experience. Dashashwamedh Ghat is the most visited ghat of Varanasi by religious pilgrims. It is also the most beautiful ghat in city and close to the famous 'Vishwanath Temple'. This Ghat is well revered for its high religious importance. The very sight of Evening Ganga Aarti or fire puja performed by the group of priests on this Varanasi Ghat will make you mesmerized. The most favored Varanasi Ghat of tourists, Assi Ghat is a regular venue for the local festivals, games and other activities. The place is favorite destination of the foreign day-trippers. You can hire a boat from this ghat and visit Dashaswamedh Ghat. A boat ride takes 1 hour for a complete trip. For the budding painters and photographers this Ghat of Varanasi is a much adored place. Manikarnika Ghat is a pre historic ghat. Here the dead bodies of Hindus are burnt. According to the age old myth, it is said that if a person dies in Varanasi, he/she will get salvation. According to the mythological legends King Harishchandra worked here as a pyre-man. Situated next to the Manikarnika Ghat, Lalita Ghat is one of the most favorite destinations for the tourists. This ghat is known for the Ganga Keshava Temple, which is dedicated to Lord Vishnu. Another famous Nepalese temple dedicated to Pashupateshwar or Lord Shiva also located here. The temple is built in wood in the typical Nepalese style. The Harishchandra ghat is known as the same ghat, where the owner of Manikarnika bought King Harishchandra as a slave. The ghat is yet another funeral place for Hindus. According to the myth, Tulsi Das wrote the famous epic 'Ramacharitmanas' in this ghat. Other important ghats are Kedar Ghat, Pande Ghat, Shivala Ghat and Chausathi Ghat. Ganga Ghats at Varanasi are fused in the daily routines of the locals. Life gets started at 3 a.m. in Varanasi Ganga Ghats and continues keep rolling till 8 in evening. 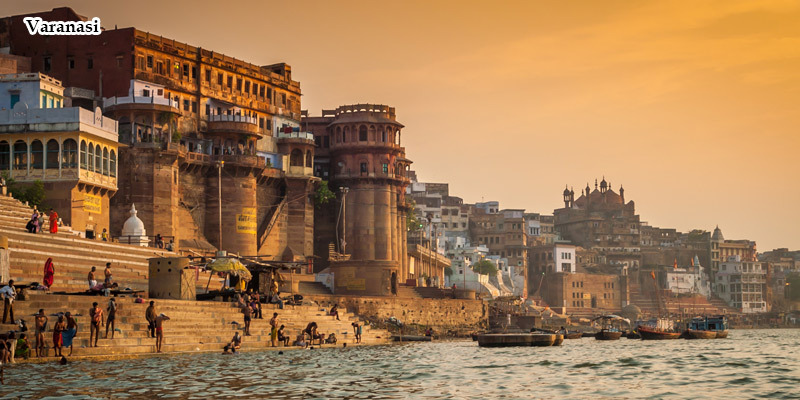 Explore the Varanasi ghats by your own. Find some of the very good hotels, restaurants, cafes, book shops, music shops flanking these Ghats. Buy some souvenirs from the small stalls, selling religiously important things, like chains, stones, idols and religious books. A morning one hour boat ride across the river Ganga, is worth doing. Walk along the Ganges Ghats at Varanasi and behold several Hindu devotees taking a holy bath in the river and offering water to God Surya (Sun). See a cremation here on the Manikarnika Ghat. While you are in Varanasi, you get extraordinary opportunities for shopping. Engage yourself in a extensive shopping extravaganza. Venture the major shopping areas in Varanasi, which include Vishwanath Gali, Godoulia, Gyanvapi, The Chowk and Thatheri Baazar. Apart from the famous silk sarees, gorgeous glass bangles, brass and copper items, and unique gift products are very famous here. Evening, enjoy a rickshaw ride through out the city. You can find a number of historical and religious tourist destinations around Varanasi Ghat. Sarnath is about 10 km from Varanasi and is famous for its association with Lord Buddha. 40 km from Varanasi, Chunar Fort, is a place worth visiting. Other Major important close tourist designations are Jaunpur, Kaushambi, Kushinagar and Vindhaychal.